Everyone knows stuffing is one of the best parts of Thanksgiving, and it seems to be the only time of year where people make the filling treat. No one quite knows when stuffing was first used, but it was first documented in a Roman cookbook that contained recipes for stuffed chicken, hare, pig and dormouse. Recipes called for veggies, herbs, spices, nuts, an old cereal and frequently included chopped liver, brains and other organ meat. In the Middle Ages, stuffing was known as farce, from the French meaning forcemeat. The word stuffing shows up in 1538. Victorian English replaced the word with dressing around 1880. Regardless of what you call it, let’s get started so the dinner can be completed using this food.com recipe. Place 1 cup of diced dried apricot and 1 cup of Grand Marnier, apple cider or orange juice in a small saucepan. Heat to a boil and remove from the heat and set aside. Then, melt ½ cup of butter in a large skillet over medium heat. Add 2 cups of coarsely chopped celery and on large onion chopped. Saute for 10 minutes then transfer to a large bowl. In the same skillet, cook 1 pound of bulk pork sausage, crumbling it with a fork until there is no more pink. Then, remove from heat and add it to the celery and onion mixture. Add 1 pound of stuffing mix with the previously cooked apricots with the liquid, and one cup of slivered almonds to the stuffing mixture in the large bowl. Heat the remaining ½ cup of butter and 2 cups of chicken broth until the butter melts. Pour the mixture over the stuffing mixture and add the remaining ½ cup of Grand Marnier, apple cider or orange juice. Stir well to moisten the stuffing. Then, add a ½ teaspoon of dried thyme. Salt and pepper to taste. 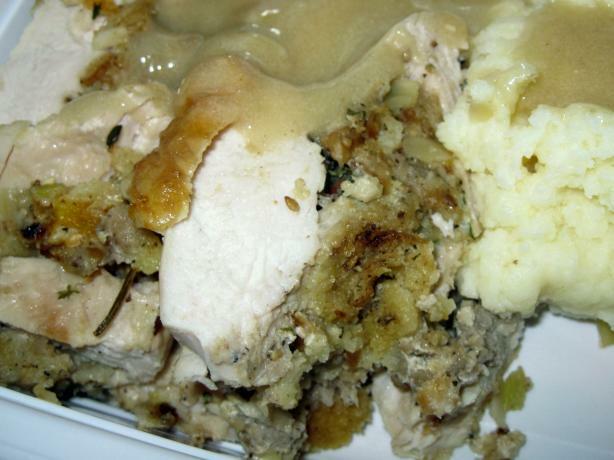 Bake the stuffing in a large buttered casserole at 325 degrees for 30 to 35 minutes. Although if you’d like to use the stuffing to actually cook in a bird, you’ll have enough for a 21- to 24-pound bird with a small extra casserole on the side. To stuff or not to stuff is another Thanksgiving question to consider – a question we’ll tackle in our next blog. This recipe sounds AMAZING!! I can not wait to try it on Thanksgiving! I know the kids will love to help with this one as well!